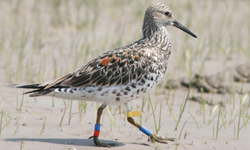 GFN commenced colour-banding Red Knot on February 19 2006. Red knot are far less abundant than Great Knot in Roebuck bay. They occur in the dense knot flocks at approximately 8-12% of total knots. This of course makes them less easy to catch than Great Knot but one of the successes of the project has been our ability to target this species for capture and be highly successful at it as reflected in the total numbers caught. 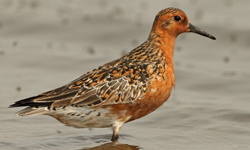 Red Knots use all of the beaches to roost on along the northern shores and also Bush Point in the south of the Bay although we do not catch there. 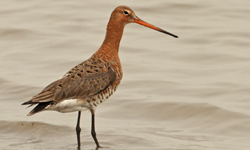 They do not leave the Bay after heavy rainfall like the Black-tailed Godwit but they will roost behind the mangroves on flooded saltpans. The pans can become flooded from rainfall or during the bigger spring tides. 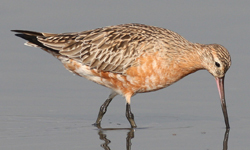 The overseas records of colour-banded Red Knot are overwhelmingly from Bohai Bay in northern China (see other pages of this website for detailed reports. There also a few records from the southern Chinese coast and Taiwan. The other country where many of the Red Knots banded in Roebuck Bay go to is New Zealand. This is explained further in the examples below.